Click chart for full-sized version. 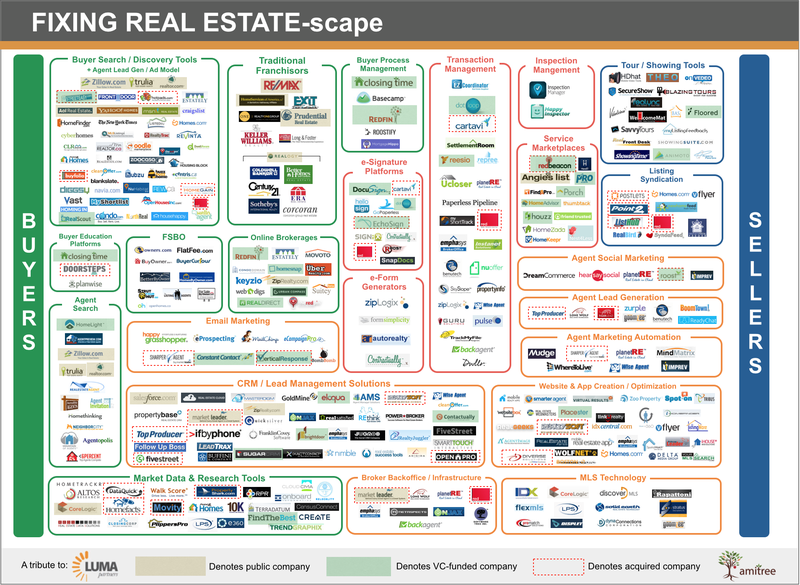 Back by popular demand is the Fixing Real Estate-Scape, again inspired by LUMA Partners‘ Terrence Kawaja. We’ve scoured Inman News stories, Angelist, CrunchBase and collected data from SEC filings to deliver this year’s chart, which is still very much a work in progress. The outpouring of corrections and additions last year was more than welcome and helped make it a lot better. Keep them coming. So what’s changed? Where are we? In the year or so since we originally published this chart, we saw our predictions of an increase in VC funding, mergers and acquisitions (M&A) and public market valuations come true … sort of. Some bright spots for certain: Zillow is now riding high at a $4 billion market cap, up more than 100 percent in the last year. Redfin is on a tear. VC came in to some pure-play real estate technology companies (more on that below), but even more so in the service marketplaces that serve the real estate category. And not just small firms, but the big ones. And there was some M&A, though nothing above $50 million from any pure-play real estate technology company. In summary: This is “still early days.” The largest financings were for companies that are bringing innovation to search/discovery (e.g., Urban Compass, Redfin) or companies who play in many verticals in addition to real estate (e.g., FindTheBest). Here is our best effort to catalog the companies in this chart who are publicly traded, took institutional funding (i.e., VC funding, not individual/angel investor funding), and/or were acquired. Since we didn’t include these data points in last year’s chart, these stats are not necessarily limited to events over the last year. This is the current snapshot of institutional funding, M&A and public market valuations in real estate technology. Side notes: 1) This will focus mainly on companies who play in residential real estate as a core function of their business, as many giant public companies on this chart (e.g., Salesforce) aren’t relevant comparables. 2) We aren’t including the franchisors in this analysis, where we saw the IPO of Re/Max and some M&A (namely Intero’s acquisition by Berkshire Hathaway’s HomeServices in addition to the latter’s acquisition of Prudential Rubloff Properties last year). 3) This analysis doesn’t include the rental market, which has seen a some impressive VC funding (e.g., Apartment List, Zumper, Lovely, et al.) and one large acquisition of Apartments.com by CoStar. 4) This also ignores the giant mortgage and title services market, which could (and should) get its own chart and analysis. Big moves like this one are certainly reason enough. And finally, 6) We’ve focused this analysis on the categories that seem to have the most movement in the past year. Now let’s get to it! Several acquisitions, mostly by Zillow. Namely: StreetEasy ($50M), HotPads ($16M), Buyfolio (undisclosed). In addition, there was HomeGain (acquired by Reply for an undisclosed amount), and RED Digital, acquired by Nationstar Mortgage ($18M). CoreLogic ($2.54B market cap as of 5/15/14). While real estate is only one part of their business, they’ve been busy bulking up their real estate technology portfolio, including the recent acquisition of Case-Shiller and perhaps more notably its integration of DataQuick Information Systems, which it acquired for $661M this year. Add that to Equecat (provider of catastrophe risk models, software, data products and consulting for insurance) and CDS Business Mapping and Inman News had it right when it said CoreLogic is on quite a “tear” as of late. Market Leader, once public, now part of Trulia after a $355M acquisition a year ago. And at least one notable acqusition: FiveStreet was acquired by Move Inc. for $4.8M. Jonathan Aizen is the founder and CEO of Amitree Inc., the developer of Closing Time, a tool to help home buyers and their agents navigate the process of buying a home, organizing the dozens of tasks into an easy-to understand checklist that is customized for each buyer’s unique situation. 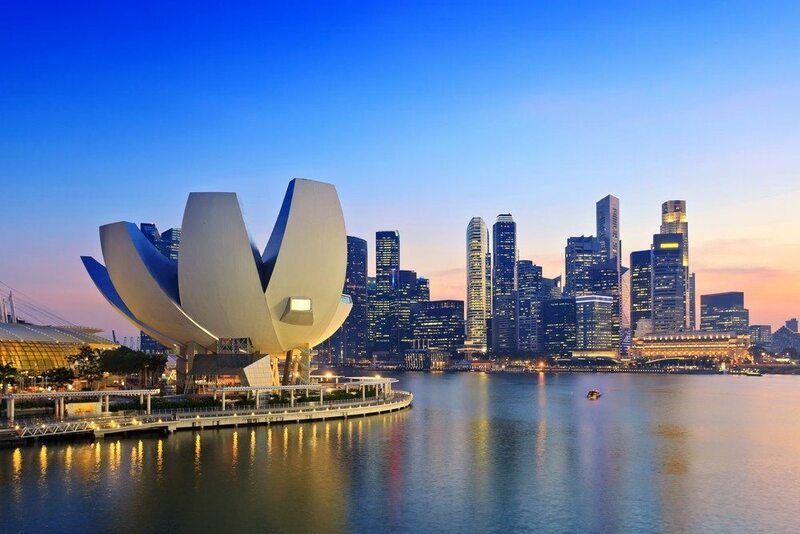 Amitree is backed by the venture capital firm Accel Partners as well as Morado Venture Partners, Owen Van Natta, Jerry Yang, Gideon Yu, Vishal Makhijani, Rob Chandra, and Farzad Nazem. Editor’s note: This article was updated on May 21, 2014 to include additional companies suggested by readers.